High Wycombe, UK, 23 September 2016 – At Restaurant Tech Live 2016 (27 – 28 September, ExCel, London), Star Micronics (Stand 1150) will be demonstrating the future of POS connectivity with pioneering solutions from a number of its kiosk and software partners including Evoke, Integer, Just eMenu and SWOOPOS. Star offers a range of flexible solutions that can easily be upgraded as your POS system evolves. From complex hospitality systems to a simple pop-up setup, Star has the expertise and wealth of experience to provide a tailored cost-effective solution. Leading the field in traditional POS and mPOS with the very latest Cloud Bluetooth and wireless counter-top and mobile printing solutions for tablet POS applications, Star’s customers include McDonald’s, Premier Inn and Costa Coffee. Visitors to the Star stand will experience a wide portfolio of mPOS solutions demonstrated by a number of its kiosk and hospitality software partners. Latest innovations that have been integrated include mPOP™, a unique combined Bluetooth printer and cash drawer mobile point of purchase solution which is low cost and lightweight at just 10cm high and 30cm wide with a sleek design. With the POPPack option that includes a high quality black or white tablet stand (alternative colours are available if required) and metal plate, users can successfully create a stylish mPOS station. The POPPack design provides a flexible option with the extra security required within a busy hospitality environment, whilst retaining the mobile element. This provides the ability to securely store or transport the mPOS station at the end of trading. 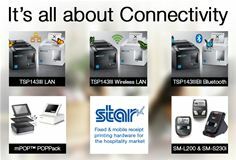 For operators looking for a high performance counter-top printer the latest additions to the TSP100 futurePRNT™ series from Star – TSP143III Wireless LAN (WiFi) and TSP143III Bluetooth offer cable-free high speed Bluetooth and WiFi mPOS printing solutions combined with futurePRNT software. The TSP100 series also includes the convenience of an internal power supply along with a vertical mount kit in the box and provides compatibility with major operating systems including Android, iOS, Linux, Mac OS and Windows. The TSP143III Wireless LAN provides easy pairing thanks to a simple WPS connection offering straightforward wireless setup while the TSP143III Bluetooth model features an autoconnect function for iOS after power on or an out-of-range situation thus ensuring functionality at all times. Demonstrating Star’s focus on connectivity, hospitality operators can today purchase a Star TSP654II with a traditional interface in the knowledge that it is future-proofed for whatever cloud strategy the operator wants to adopt and provides an easy, affordable upgrade by simply replacing the traditional interface with the HI X interface. The interface can also be used with other Star printer models that offer 80/112mm label, ticket and receipt printing – TSP743II and TSP847II as well as SP700 matrix printer. Alternatively, the TSP654II HI X Connect receipt printer is ready for the Cloud with the HI X interface built in. Both solutions offer intelligent printing for modern Cloud hospitality printing. Star will also be demonstrating a free-of-charge digital receipting service that is available across Star’s range of single station thermal POS printers. This service offers a fast route to providing the customer with a digital copy of a print receipt as well as access to analytics, an in-store customer survey and device management tools that provide the real-time status of printers across the entire estate. With zero development required, the service is enabled within the printer driver and works independently of POS software. Triggered by a traditional printed receipt, a digital copy of the receipt is sent to theAllReceipts™ App on the customer’s mobile with no email address or mobile number required. Receipts can only be claimed once and are then deleted, while saved receipts can be viewed by date or by operator with personal or business tags on the customer’s device.